Eight of us in the Primary Ciliary Dyskinesia (PCD) family have teamed up to do the Amerithon Challenge, presented by Run The Edge. The challenge started on July 4 (you can still register solo or form your own team). We are virtually crossing the US by walking running, biking, rowing, ellipticalling, among other forms of exercise. Four of us have PCD, two of us are mothers to PCDers, and two of us are spouses to PCDers. We may have eight bodies participating but if you add up our lung capacity the four of us with PCD only add up to the capacity of two "normal" lungs. As of January 13 our team has completed all 3,521 miles. Mary is continuing the journey solo. 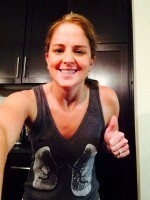 Leslie is the mom of three young adults with PCD. Her kids were all diagnosed at a young age and are leading relatively healthy and productive lives – the oldest is an artist, the youngest a singer and theatre performer, and the middle child (who also has situs inversus) is the most organized person in the world who will graduate from college with a major and three minors (and a 3.8 gpa) in just three years. Leslie always says she has earned an honorary RN degree by caring for her kids and usually has to educate new doctors about the idiosyncrasies of her children’s chronic disease. She is happy to be part of this inspiring group! Kathryn didn’t get a PCD diagnosis until she was almost 30 years old, which isn’t uncommon, unfortunately. She was very active as a child and a young adult, despite being sick much of the time. But her physical and mental energy reserves declined with every new lung infection, until she was hardly exercising at all, and she had to stop working last year. After starting physical therapy a few months ago, she is back to exercising regularly and loves every minute of it. Being a part of this team motivates her to keep moving! This is Rebecca. At 33 years old, life has taken many twists and turns. Her journey with PCD began at birth, arriving 7 weeks early into the world. It would take 27 years, many doctors and many tests to get the proper diagnosis of PCD. She is currently on the transplant list, waiting for a double lung transplant. Rebecca enjoys spending time with family and friends, cooking and her two dogs. She is a Registered Nurse and hopes to one day return to the work she is so passionate about. She also works diligently to maintain what little lung function she has left, by working out everyday and using supplemental oxygen. Her motto these days, "Let's Rock & Roll"!! This is Libby, she's 23 with a 3 year old PCD'er. Her journey started shortly after her daughter was born in respiratory distress. She dedicates her time to improving her health to be a role model for her PCD'er. She's currently attending college to become an RN, graduating in May. 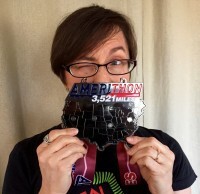 Libby was on Running On Air's Amerithon team, which virtually crossed the US, 3,521 miles in about 6 months. This is Bob. He is 38 years old and has been married to Rebecca Haskin, who has PCD, for almost 8 years. Bob enjoys spending his free time working out, riding motorcycles, bowling and cooking. Bob's journey with PCD began when he met Rebecca, before she was formally diagnosed. He has become very knowledgeable in PCD and is an advocate for Rebecca and all those with PCD, participating in fundraisers and going to countless appointments with Rebecca. Bob works as a consultant in "Information and Discovery Management" field with Morae Legal, in Houston, TX. He loves to try new things, explore new food and always knows how to have a good time! As a child, running was torture for Ed. He was asthmatic and overweight. At age 23, he took a course called Breakthrough Running and went from barely completing a mile to running the Annapolis 10 Miler. Running became an act of freedom. Coincidentally the movie Chariots of Fire came out and fanned the flames. He stopped running for a while and focused his physical activity on playing the bagpipes. He has played at all levels of pipe band competitons and played at the World Pipe Band Championships twice. He just retired from teaching in the public school system and now teaches bagpiping at the US Naval Academy. 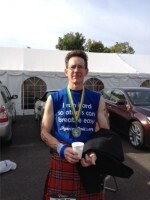 One of Ed's best running moments is finishing 2nd in his age group at the Celtic Classic the last 2 years.